eTimesheets is a Mobile Business Application designed to help employees and contractors who need to log in their hours of work for payment. Designed for our partner, Fulton Hogan, eTimesheets has been designed for employees to login from desktops, mobiles or tablets using their company credentials and entering their hours worked irrespective of their location. A custom-made mobile app, eTimesheets can be accessed alongside eDJR or Electronic-Daily Job Report which enables a site manager to access and change time-sheets for their employees. In the eDJR Mobile App, the foremen for each project need to record a summary of work completed each day, by their job, detailing all the labour, plant and materials used on site. Traditionally this was done on paper-based daily job sheets (or DJR's), and then handed in to respective managers for review and processing. Information collected on the eDJR is important for several key processes including the calculation of internal plant costs and linking each project to a job code. The eDJR Mobile app interfaces with the DJR Manager desktop application for the Fulton Hogan managers to view and approve daily job reports and run reports to track how their department is doing in real time. Unlike DJR or eDJR, this app is not solely a manager’s application but can be accessed freely by an employee. On the screen seen above, once you have tapped on time-sheets, you would view a page which would have dates and blocks for you to enter the number of hours you've worked, number of hours you've taken as break-time followed by your project details. On each row, you would also be given the option to view if you are allowed time-sheet allowances based on your project type. Fulton Hogan provides add-on allowances for certain projects or work types, if you are eligible for such an extra allowance, this should come up on the right-hand of each row, once you tap on the three dots in the corner. Clicking on New Leave Request enables you to apply for leave immediately. The new leave request option opens to a pre-set form which you can quickly complete and submit in a matter of minutes! Once you have submitted your request for leave, you can view the status of your application on the same page which would shift between, Submitted to In Progress to Approved/Declined. The next option on the Main Menu is the Activity Log. Under this tab, you can view the hours you have submitted, whether they have been approved or are in progress of being approved or declined and lastly, you can also view the status of your leave here. As a Fulton Hogan application, eTimesheets is closely related to eDJR as pivotal features of both applications have been synced together and members of the company can view the changes from either application. Employees can add eDJR time bands to their timesheets with just a tap. This option, which can be found under “add time band” option on the row can be edited or deleted and would be visible on the time-sheet row where you enter the hours, as seen below. An edited eDJR time band would have the text on top. A deleted eDJR time band is displayed as a row and it gives the user a link to the activity log where they can find out more information about why it was deleted. This brings us to the possible issue of an overlapping eDJR time band. If a time band that gets pulled in from eDJR overlaps with an existing time band, the overlapping time bands will appear differently and would be easy to spot on the screen. An employee friendly app, users can access eTimesheets by going to www.salesforce.com and using your company credentials to login. Fulton Hogan provides add-on allowances for certain projects or work types, if users are eligible for such an extra allowance, this should come up on the right-hand of each row, once you click on the three dots in the corner. 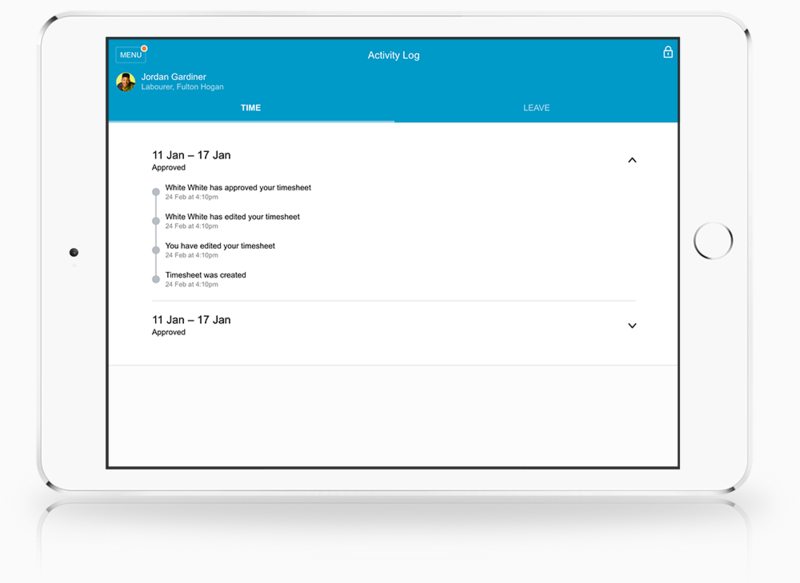 With the mobile app, the screens for eTimesheets are a lot more compact so that the user experience is enhanced. By tapping on timesheets, you would be able to view a table where you can enter the number of hours you have worked next to the dates and days of the week. If a time band is pulled from eDJR, as seen in case of a tablet or desktop, it would be visible as you enter your hours in timesheets. After a user has entered their hours adjacent to each day of the week, they can tap on save and then go back to the main menu. In case of a time band overlap for a day occurs with eDJR, the day will receive a warning icon on the period view screen. Users can submit the timesheet and go back to the main menu to access the Leave tab. On the main menu, you can see LEAVE listed under the timesheets tab. On the Leave tab, you as the user can view the number of annual leave days left, long service leave days and alternative holidays. When the user selects the 'Requests' tab on the 'My Leave' screen, they will see this screen. The user can select either 'Partial day' or 'Full day or more' to go ahead with the Leave request. To close the draw the user can tap the 'X' or tap anywhere above the tab to return to the page. If you tap on ‘leave’ under activity log, you will find all the status changes listed against each of the user’s leave requests. The orange notification on the menu button is used to indicate an unseen activity within the activity log. Pop up messages will alert you if there are any changes or updates. Lastly, under the tab named ‘History’ on the main menu, the user will find all their activity along with a list of approvals or declines from the manager. You as the user can also view the number of leave days and the payments that have been made against the dates you have submitted on the timesheet. To leverage the data that is already captured by each of the Fulton Hogan employees every day via the eDJR, this data is interfaced onto individual employees’ timesheets. So, employees can simply log into the eTimesheet app, check whether the details entered are correct or make any adjustments and then submit the timesheet for payment. This saves a significant amount of time when compared to paper-based timesheet entry. Data is updated in real-time between the two systems (eDJR and eTimesheets), so any changes made by an employee would be visible to their managers both via the eDJR Manager as well as the approver for eTimesheets. To find out how we can improve your business processes with smart app development for mobile, web or desktop contact us today.